Santa Monica Pier and El Pueblo de Los Angeles will appeal to history buffs. Get in touch with nature at Venice Beach and Boardwalk and Will Rogers State Beach. Next up on the itinerary: examine the collection at The Getty Center, admire the landmark architecture of Italian American Museum of Los Angeles, appreciate the extensive heritage of Venice Canals Walkway, and learn more about the world around you at La Brea Tar Pits and Museum. To find ratings, photos, and more tourist information, you can read our Los Angeles online road trip planner . Oslo, Norway to Los Angeles is an approximately 14-hour flight. You can also do a combination of flight and bus. You'll gain 9 hours traveling from Oslo to Los Angeles due to the time zone difference. Plan for warmer temperatures traveling from Oslo in September, with highs in Los Angeles at 34°C and lows at 22°C. Finish your sightseeing early on the 27th (Fri) so you can drive to Grand Canyon National Park. Escape the urban bustle at Rim Trail and Bright Angel Trail. Eschew the tourist crowds and head to South Kaibab Trail and Yavapai Point. There's lots more to do: take in breathtaking views at Grand Canyon South Rim, make a trip to Powell Point, and take some stellar pictures from Mather Point. To see other places to visit, ratings, maps, and other tourist information, read our Grand Canyon National Park online trip planner . Traveling by car from Los Angeles to Grand Canyon National Park takes 7.5 hours. Alternatively, you can do a combination of flight and bus; or do a combination of flight and shuttle. You'll lose 1 hour traveling from Los Angeles to Grand Canyon National Park due to the time zone difference. While traveling from Los Angeles, expect slightly colder days and colder nights in Grand Canyon National Park, ranging from highs of 28°C to lows of 7°C. Finish up your sightseeing early on the 30th (Mon) so you can travel to Las Vegas. Step off the beaten path and head to Valley of Fire State Park and Atlatl Rock. Your cultural itinerary includes sights like The Strip and The Neon Museum. 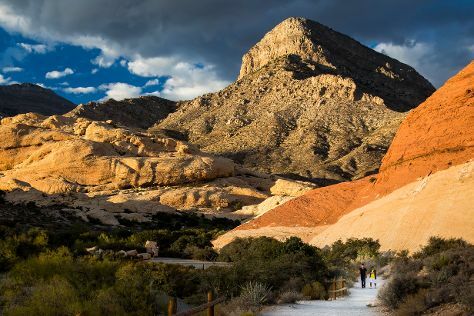 Next up on the itinerary: immerse yourself in nature at Red Rock Canyon National Conservation Area, ponder the design of Bellagio Fountains, see the interesting displays at The Mob Museum, and take an in-depth tour of Titanic. To see more things to do, other places to visit, reviews, and other tourist information, read Las Vegas trip planner . Traveling by combination of flight and car from Grand Canyon National Park to Las Vegas takes 4.5 hours. Alternatively, you can drive; or take a shuttle. Traveling from Grand Canyon National Park to Las Vegas, you'll gain 1 hour due to the time zone difference. Traveling from Grand Canyon National Park in September, you will find days in Las Vegas are somewhat warmer (39°C), and nights are much warmer (25°C). Wrap up your sightseeing on the 3rd (Thu) to allow time to drive to Death Valley National Park. On the 4th (Fri), explore the striking landscape at Zabriskie Point, then cruise along Artists Dr, and then don't miss a visit to Mesquite Flat Sand Dunes. On the 5th (Sat), you'll have a packed day of sightseeing: trek along Salt Creek Interpretive Trail, get great views at Dante's View, and then explore the activities along Badwater Basin. For maps and more tourist information, use the Death Valley National Park trip tool . Getting from Las Vegas to Death Valley National Park by car takes about 2.5 hours. Other options: take a bus. Traveling from Las Vegas in October, expect little chillier with lows of 13°C in Death Valley National Park. Finish up your sightseeing early on the 5th (Sat) so you can go by car to Yosemite National Park. Get a sense of the local culture at Bodie State Historic Park and Bodie. Visiting Tunnel View and Yosemite Falls will get you outdoors. Spend the 9th (Wed) exploring nature at Bridalveil Fall. 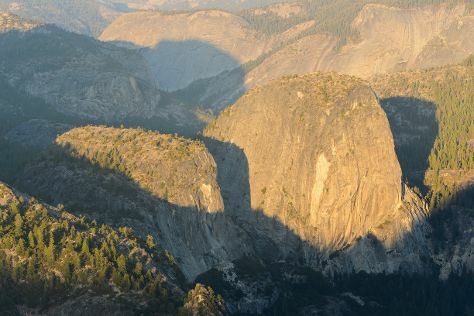 Next up on the itinerary: take in the dramatic natural features at Glacier Point, take in the awesome beauty at Cathedral Beach Picnic Area, don't miss a visit to Olmsted Point, and take in the dramatic scenery at Vernal Fall. To see photos, maps, other places to visit, and other tourist information, you can read our Yosemite National Park trip planner . Drive from Death Valley National Park to Yosemite National Park in 8 hours. Alternatively, you can do a combination of car and bus. When traveling from Death Valley National Park in October, plan for slightly colder days and cooler nights in Yosemite National Park: temperatures range from 22°C by day to -2°C at night. Finish your sightseeing early on the 10th (Thu) so you can travel to Big Sur. On the 11th (Fri), kick back and relax at Pfeiffer State Beach, admire the majestic nature at Julia Pfeiffer Burns State Park, then admire the sheer force of McWay Falls, and finally trek along Partington Cove. Keep things going the next day: immerse yourself in nature at Limekiln State Park, contemplate in the serene atmosphere at New Camaldoli Hermitage, and then hike along Pacific Valley Bluff Trail. To see maps, traveler tips, reviews, and more tourist information, you can read our Big Sur travel route planner. The Route module can help you plan travel from Yosemite National Park to Big Sur. Traveling from Yosemite National Park in October, plan for warmer nights in Big Sur, with lows around 13°C. Finish your sightseeing early on the 12th (Sat) to allow enough time to drive to San Francisco. Get in touch with nature at Alcatraz Island and Muir Woods National Monument. Do some cultural sightseeing at Castello di Amorosa and Twin Peaks. Step out of San Francisco with an excursion to Bodega Dunes in Bodega--about 1h 25 min away. There's lots more to do: snap pictures at Golden Gate Bridge, contemplate the long history of SS Jeremiah O'Brien, stop by City Lights Booksellers, and don't miss a visit to Washington Square. For reviews, ratings, maps, and more tourist information, read San Francisco attractions planning site . Traveling by car from Big Sur to San Francisco takes 3 hours. Alternatively, you can do a combination of taxi and flight; or do a combination of taxi and train. Expect a daytime high around 26°C in October, and nighttime lows around 15°C. Wrap up your sightseeing on the 15th (Tue) early enough to travel back home.